Todd Reveals Trump’s Secret Notes on the State of the Union! Donald Trump is crazy like a fox …. suffering from rabies. 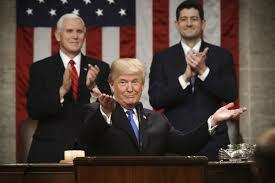 On Tuesday night, in his first official State of the Union Address, he spent close to 90 minutes exulting platitudes about American greatness, American perseverance, and American speculation. Thankfully, I have obtained liner notes of the original draft, as the speech was originally written. These are actual margin notes, made by Trump, that he didn’t want anyone to see. So, just for you, the “Todd Flora’s America” reader, I present to you some of my favorite lines. You’ll see first the State of the Union (SOTU) version of what was said, and then Trump’s notes in the original draft, representing what Trump really wanted to say but was talked out of. Friends, let’s hope my “contact” can feed us more margin notes from the President in speeches to come. Thanks for transcribing this. I understand the notes were written in crayon, so it would have otherwise been very difficult for us to read.